Caragh Lake House is a luxury vacation rental, set on the shores of Caragh Lake, a large scenic lake in the Reeks District, County Kerry, Ireland. With your own private lakefront, beautiful spacious interior and breathtaking 180º views. This secluded six bedroom villa is the perfect place for your next family reunion or group getaway in the Reeks District. Caragh Lake is a large scenic lake set within a Special Area of Conservation that includes the Killarney National Park, Macgillycuddy’s Reeks and Caragh River Catchment. Half an hour by car from Kerry Airport, seven minutes from Killorglin – a bustling market town; and a short drive from Rossbeigh – a beautiful Blue Flag beach; Caragh Lake is the perfect base for your vacation in this fabulous part of South West Ireland. Discover it for yourself by playing this short film of a day out exploring the lake, taken in early autumn. Caragh Lake House is a large six bedroom lakeside vacation rental with breath-taking views of Caragh Lake, Seefin Mountain and the Dingle Peninsula. The house sleeps 12 people with six bedrooms and six bathrooms. Each bedroom has 100% cotton sateen sheets with white goose down duvets and pillows. Find the room that's best for you. The house has recently been updated with all modern conveniences. In addition to the standard amenities these are a few we wanted to highlight. The house has strong WiFi throughout free of charge, with speeds of up to 10MB down and 3MB up. The main living room has a large open fire, perfect for those lazy evenings. Timber is provided. There’s a raised stone patio outside overlooking the lake with ample seating to relax and dine al fresco along with a Weber barbecue for those long summer evenings. Both living areas have widescreen TV’s with Irish, English, German, French and other international channels as well as the latest games, movies and TV shows via Apple TV. If you want to go and explore the lake under your own steam we can provide boats and bikes for the duration of your stay. Please enquire about rates and availability. We can also arrange for those little extras – a breakfast hamper on arrival, in-house chefs to cook a delicious meal or expert yoga instructors to come and visit. Just let us know how we can help. 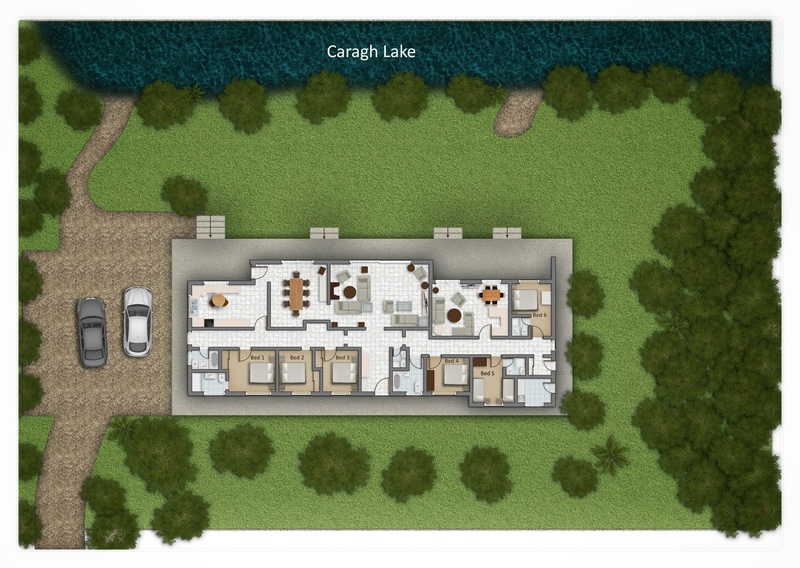 Caragh Lake House is just off the Ring of Kerry and Wild Atlantic Way in the Reeks District and within easy reach of Killarney, Dingle and the Skellig Ring. Kerry Airport, with direct flights from London, Frankfurt and Berlin, is half an hour by car, with Shannon and Cork International Airports less than a two hour drive. There is so much to do on and around Caragh Lake. Here are just a few ideas we hope will make your stay an extra special one. All linen, towels, utilities, firewood and final clean are included. Bookings are subject to a €750 fully refundable damage deposit. This house is unbelievable. Yes, the pictures are real. Terrific hosts. You may just never want to leave. A wonderful oasis. The calm of water and the stimulation of wonderful surroundings. Lovely hosts. I wish I could wake up to those beautiful lake views every day! We hope to come back again someday!